Homecambridge first B2An exercise for B2 first preparation of writing skills with questions 5. May 18, 2018 julia cambridge first B2 Comments Off on An exercise for B2 first preparation of writing skills with questions 5. FCE Course Lesson1 4 – An exercise for B2 first preparation of writing skills with questions 5. 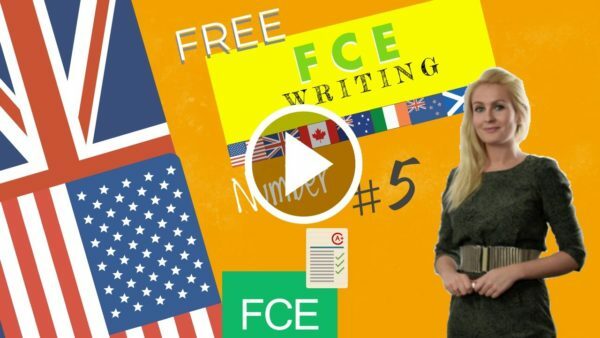 In this lesson we will listen to a conversation between a Cambridge teacher and a student about FCE writing. We will learn to talk about pros and cons and go over vocabulary related to film, books and travel to practise writing detailed reviews. GORDON: Ok, Emma. Now, we will move on to reviews. So, I want you to think of the last film you saw. Whether it’s negative or positive, I want you to write a review of this film. EMMA: Ok, so I’m going to write a review of “The Great Gatsby”, a film that I watched at home on Saturday. GORDON: I watched that in the cinema when it first came out. What did you think of it? EMMA: I really enjoyed it. My favourite aspect was the costume design, all of the 1920’s dresses which the girls wore were so beautiful and they added to the overall glamour of the film. I thought all of the actors gave brilliant performances, especially Leonardo DiCaprio who was sublime! Did you like it? GORDON: Honestly, I really didn’t. Maybe it’s because it is based on one of my favourite books of all time. For me, it just didn’t do the book justice. Crucial elements of the story were not included in the plot of the film. If I were you, I would read the book and you will see that it is a million times better! Anyway, I take it you’re going to write a positive review. I would like you to articulate your opinion into the correct structure of a review. Make sure to start off by giving a brief summary of the film’s plot, then add your opinion and justify this with examples from the film. EMMA: Ok. I will use lots of positive phrases such as “breakthrough performance”, “excellent directorial debut” and general positive adjectives to describe aspects of the film like the actors, the plot and the direction. I’m ready! Vocabulary for the B2 first preparation writing skills 5. If you get a chance…. I was pleasantly surprised by… The thing I liked most was… …. would appeal to…. DISLIKES What I found disappointing was… I was disappointed by… What I disliked most was….